This is the second time that London Wildlife Trust have walked this route beginning at One Tree Hill (NOT Sydenham Hill Wood) and retracing the remnant woodlands of the Great North Wood that are accessible and connectable on foot. The Great North Wood will once have stretched from Deptford to Selhurst, with One Tree Hill, Sydenham Hill Wood, Dulwich Wood and Dulwich Upper Wood being living remnants of it, in one way or another. This is an excellent way to rediscover the natural landscape of the local area and learn about its history, as well as some very good exercise. The meeting point is 12noon at the Honor Oak Park entrance to One Tree Hill, next to the Hindu Temple on the road leading up to St. Augustine’s Church. We will walk over the hill to Brenchley Gardens, along Wood Vale to admire the ancient oak boundary trees and down to Cox’s Walk, into Sydenham Hill Wood, through to Dulwich Wood, out and over to Dulwich Upper Wood and then up onto the Crystal Palace Park ridge, just through from the parade. The approximate duration is 4 hours, keeping in mind the walk is broken up by stops to discuss the history of certain parts. The walk will be mostly unsuitable for buggies due to the terrain and kissing gates in Sydenham Hill Wood and Cox’s Walk. We will be crossing major roads so extra care and attention will need to be paid on occasion. 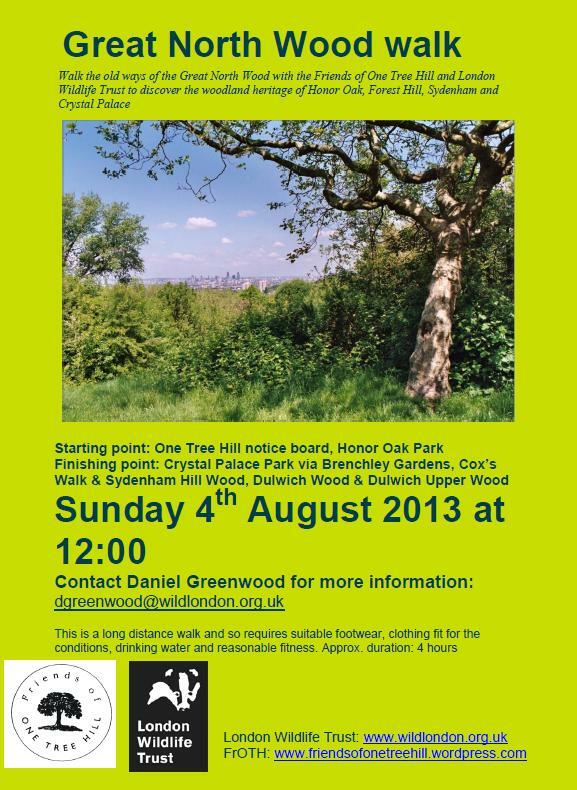 This free event is delivered in partnership between the Friends of One Tree Hill and London Wildlife Trust.